Download our Google Desktop gadget now! Following on from the success of our Windows Vista TechRadar Sidebar gadget, we're pleased to say we've got one for Google Desktop, too. Created by Grade A gadget builders BuildAGadget.com, you can also tweak lots of the configuration options such as the auto scroll timer as well as the number of stories displayed at any one time. You can also resize the gadget. The Options menu (right-click on the gadget itself) also lets you change how often the RSS feeds update, and more. If you use Google Desktop, you can download the gadget from here. 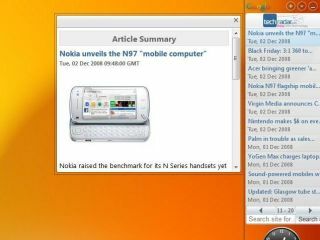 The TechRadar gadget brings the latest news to your desktop while also offering you a quick way to search our news and reviews without opening a browser. Download the gadget for your Windows Vista Sidebar and read more about BuildAGadget.com in our feature about the gadget.